Whoever coined the phrase that Christmas is a time for sharing, certainly had the supporters of Margaret Green Animal Rescue (MGAR) in mind. Following the launch of our shoebox appeal back in November we have been staggered at the response, and overwhelmed at the generosity shown to all our animals. We asked for treats, toys and goodies in a shoebox or small container, so that all the pets with us over the Christmas Holidays, would have something special of their own to open on Christmas Day. The Centre Managers at all three of the MGAR sites have been thrilled with the care and support shown to all our animals. It meant that every single pet had something to open on Christmas Day, with many getting special treats throughout the holidays. 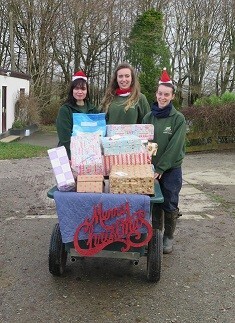 We just couldn’t do it all without the help and support of the staff, volunteers and visitors though, Kate Wickins, at the Visitor Centre in Church Knowle near Wareham said “the shoebox appeal epitomises what Christmas is about, caring and sharing, it makes you feel good to be a part of it and sets you up to do it all over again in 2017. Now, which one shall I open first?